This summer we decided to do a little experiment. 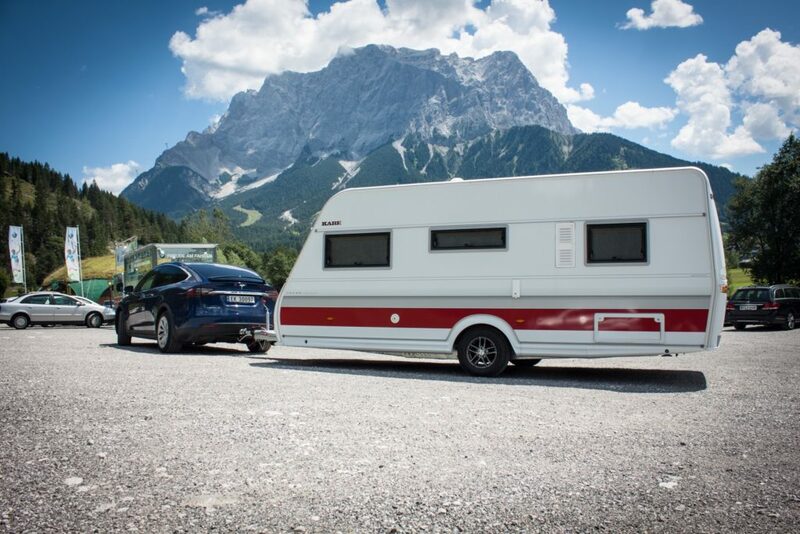 Drive through Europe with our Model X while towing a caravan. This journey took us through Norway, Sweden, Denmark, Germany, Austria and back again for a total distance of more than 6.000 km (3700+ miles). On this trip we got a lot of surprised looks, a ton of questions and met loads of nice people from all kinds of places. 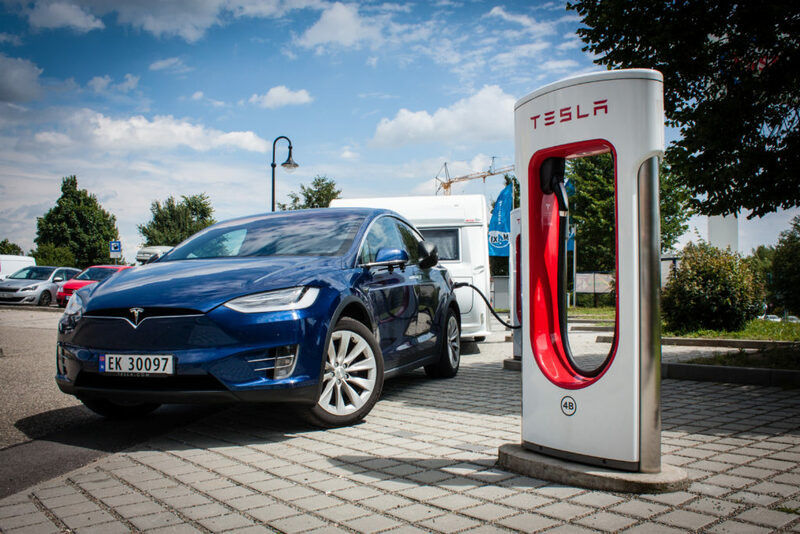 At Superchargers, campsites, the local stores, on the street, basically everywhere… many who spotted us by the car wondered what it was like. Since a lot of people asked the same questions, I thought I would answer them below for anyone else wondering. This is how most conversations started, although not really a question. We got a lot of stunned looks of people coming over. So first of, the car did great. You hardly notice that you are lugging around that extra weight. The caravan was lent to us, a Kabe 520 XL, weighs 1700kg (3750lbs) and is 2.5m (about 8’3″ imperial) wide. What this means is a lot of extra drag, and with it a big hit on range. What is the range like? The most common question really, was about the range and consumption. For our 90D, I assumed a 200km (about 125 miles) of range to be realistic, and it was. However that does not leave anything to spare, and I surely wasn’t planning on arriving anywhere with any less than 20km of typical range left. What is the consumption like? Our consumption averaged at 375wh/km (608wh/mi) for the entire distance of towing on this trip. That being said, it varied a lot. We had stretches below 300wh/km (490wh/mi) and stretches at nearly 500wh/km (810wh/mi). But in the end, every day of the journey had around the same average. The relevant international speed limit was 80km/h (50mi/h). How much did weather impact consumption? Rain is usually something I expected to eat up a lot of range, but this wasn’t the case with the trailer. We had below average consumption while driving through a serious rainstorm in Germany (without reducing speed). Wind however is a big factor! With only minor exceptions we exclusively charged at Superchargers. The main catch is that you should at least expect that you have to unhitch. 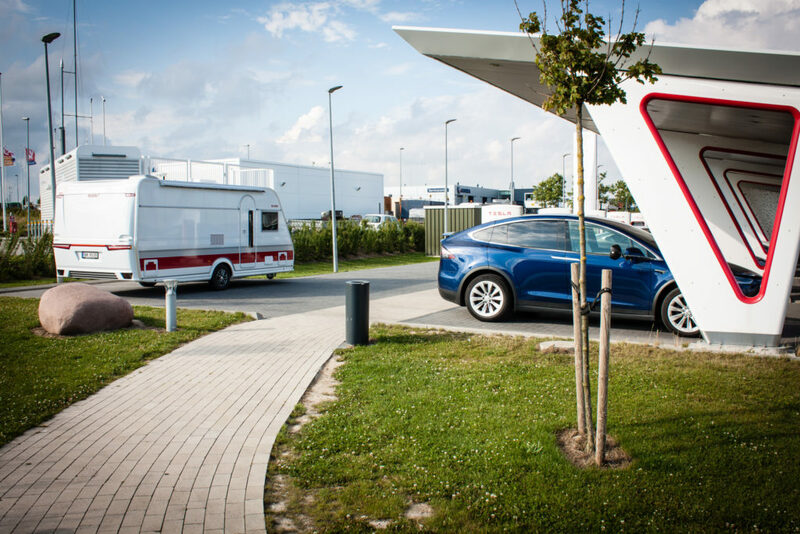 On our travel days we averaged around 400km (250 miles) and that meant several charging stops. We usually charged between a half hour and an hour. 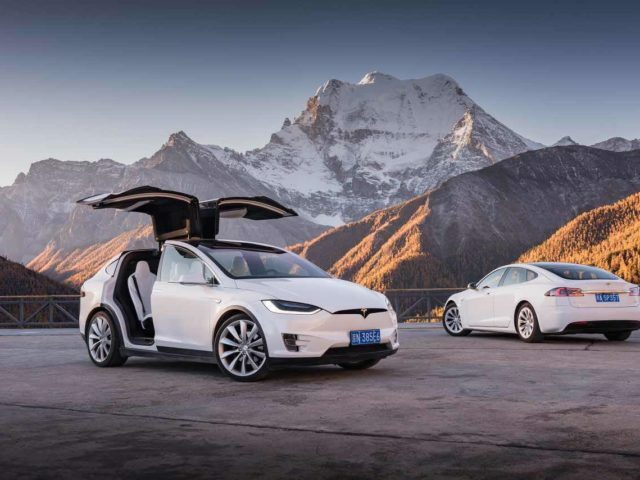 Since the car charges the fastet on a low state of charge, and the last 20% are quite slow, it quickly became a strategic consideration. Charging time was spent eating, shopping, talking to people and relaxing in the caravan itself – so it mostly flew by. When your next leg of the journey is 180km (112 miles) between superchargers you might just have to stay there for over an hour. Especially if you arrived at the charger with hardly any range left. Was unhooking the trailer a lot of hassle? After a day of unhitching and hooking it up again repeatedly you become fairly proficient at it. Next day it wasn’t really an issue anymore, within 5 minutes of arriving at the charger it would be unhitched and plugged in. Certainly learned to scout for places to park the trailer though. But every now and then, you don’t have to unhitch. Sometimes you have to be a bit creative. Can you spot the car? 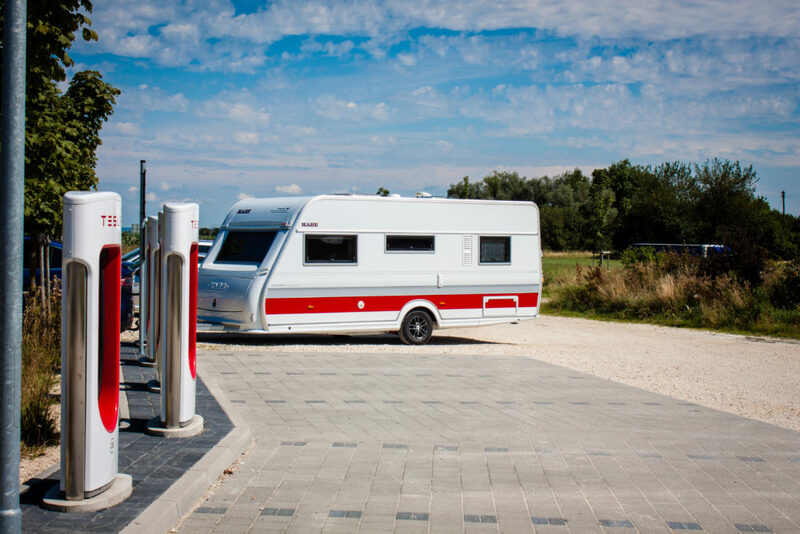 Can you charge the car at campsites? Yes you can. However, charging at campsites was just to slow for it to really make a dent, if you only stay one night at a time. But it did allow me to pre-condition the car, add a tiny bit of range and prevent vampire drain. When you are staying somewhere for several days, it will surely help, just quite slowly. Did you need a CHAdeMO adapter? Nope, but it was great to have one along for the trip as a safety net. Tesla Owner Club Norway actually has a program that allows members to loan adapters, and we were lucky enough to get one for our trip. 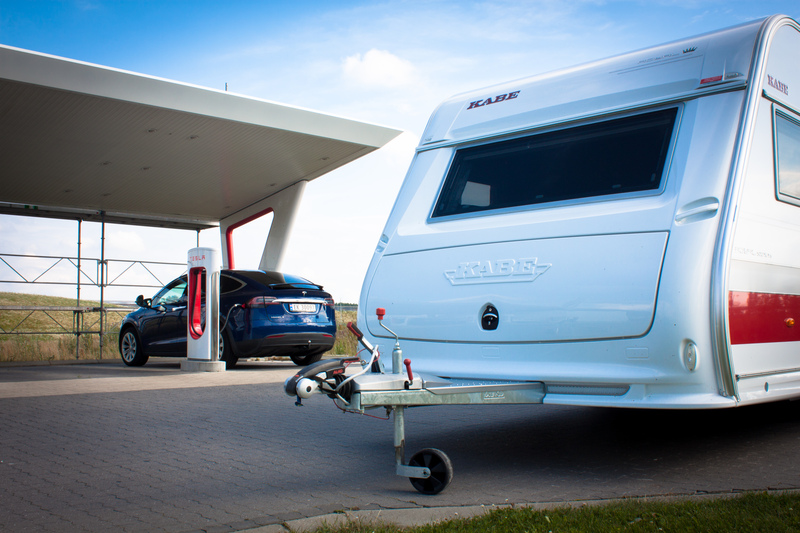 The point however remains that charging at 40-50kw feels so slow when you consider the range you add is only worth half with the trailer. But it surely beats the alternatives when you struggle to reach your next Supercharger. 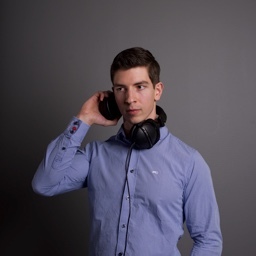 I'm a webdeveloper based in Oslo, Norway. I currently work with web development at Nettmaker. Nice! 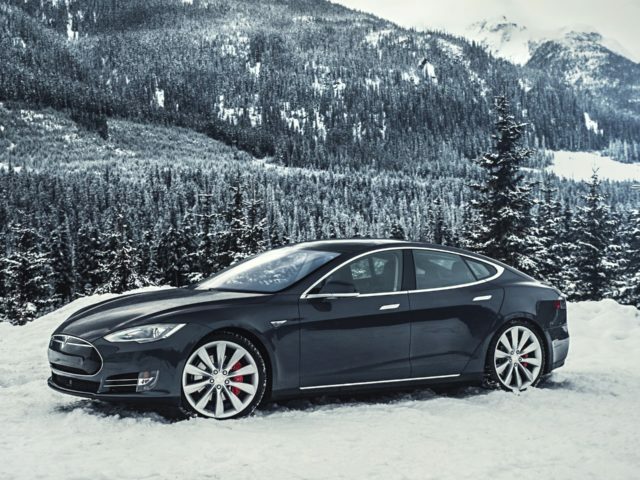 Shocks people that model x is very versatile yet maintains performance. It is in a class of its own. Indeed it does! Couldn’t agree more! Thanks, I can truly recommend trying it! Shame about the range. I have driven from Calais to Montpelier in a day, about 700 miles and takes 11.5 hrs towing a twin Axle van with a Landrover and 3 full fuel stops on the way. 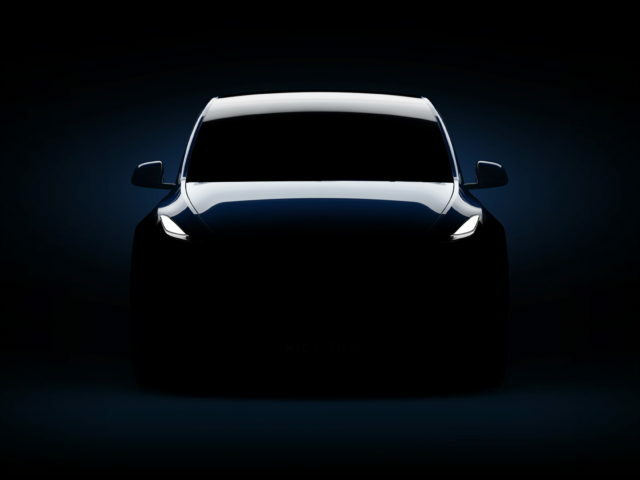 Plus I cruise around 65-70+mph electric just isn’t anywhere near yet and to do that in an electric would add a day plus in slower speed and recharging stops, apart from the torque which in the Tesla is massive.Good and honest view on your experience. I hired a Tesla to drive from Leeds to Farnborough but never made it as the range was plummeting and it took over 2 hrs at a fast charge station but couldn’t cope with driving at 50-55mph to get the range ! talk about range anxiety. To plug in at the office the small charger was quoting over 37 hrs to charge. I needed to get where I was going. Were you able to use auto pilot? Lane keep assist? Adaptive cruise control? Autopilot isn’t available when towing for the time being, but I did use adaptive cruise constantly.